The Chelsea Flower show is one day in the year that I begin to look forward to at least seven months in advance. For that is how far in advance you have to book your tickets. I’m an RHS member so I get to buy tickets for Members Day but to be honest it’s not such an exclusive club. The crowds are still huge. After the mad dash in October to secure your tickets and if you are lucky a booking for a proper lunch in one of the marquees everything settles down until much nearer the time. Remember where you put the tickets though! There is nothing worse than that heart stopping moment when you look in your ‘special’ place and find that you didn’t put your tickets there after all and later find that you in fact seem to have more than one ‘special’ place. Then the dilemma is who to share the big day with. Choose wisely if you are ever in this position. Don’t take your husband unless he is a mad keen gardener or he will spend the entire time looking at John Deere ride on mowers and extendable ladders while you are desperate to explore the show gardens. A friend with a love of gardens and some considerable stamina is what is needed. It also helps if when you suggest grabbing a Pimms they not only insist on the large one but pay the extortionate price too. £11 for a glass of Pimms! When we arrived at the station yesterday morning the platform was heaving with ladies also heading for Chelsea. The train, when it arrived, was also full of Chelsea goers. People spoke to each other about our shared destination and the weather forecast, which it has to be said wasn’t great. In the end the weather was very kind to us. The only huge deluge happened while we were having a fabulous lunch and we watched the sky darken and the thunder roll in from the warmth and protection of the Rock Bank Restaurant. The gardens this year were a real treat. No orange plastic chairs or bright red iron arteries in sight. There have been in previous years and worse besides. But the abiding lesson from this years Chelsea was STOP WEEDING! Cow Parsley seemed to abound in almost every garden and grasses flourished along side buttercups. It was all I could do not to lean in and pull up some of that swaying grass. It was a bit breezy and things definitely swayed. The annual scrum at the edge of each garden to see which medal they have been awarded is inevitable and then the discussions as to whether we feel the judges have got it right. Often we don’t feel they have but you have to remind yourself that they aren’t just saying ‘oh that’s lovely’. Apparently being lovely isn’t enough when it comes to gardens at Chelsea. The garden designers have to adhere to their original plan and most of us have no idea what this was so we aren’t in a position to judge on that criteria. You hear a lot of comments about not wanting that sort of garden at home or how impractical this or that aspect would be. But Chelsea is like London fashion week, a great spectacle, you will find inspiration but nobody expects you to wear the outfits. Along side misinformed comments there is also a spattering of men shouting into their phones, still trying to hold onto the reins of powers on a day when they should be enjoying all that is glorious about Chelsea. One chappy could be heard bellowing ‘just remove that ‘but’ from the third line in the fourth paragraph’ into his iPhone. Then there are the ones who get right to the front and the spend a few minutes checking their emails rather than looking at the garden and they are invariably 6ft tall. Chelsea can be a day for seeing just how rude middles class people can be and how sharp their elbows are. But on the whole it is all well humoured and those careering into you with their extortionately expensive Pimms are quick to offer a hearty apology. I will say humbly, and I don’t say that often, that the judges got the best in show spot on. The Chatsworth Garden by Dan Pearson was phenomenal. It benefited from being on the triangle just off the main avenue where the other big show gardens are found. This means you can walk all round the garden and enjoy it from every angle. 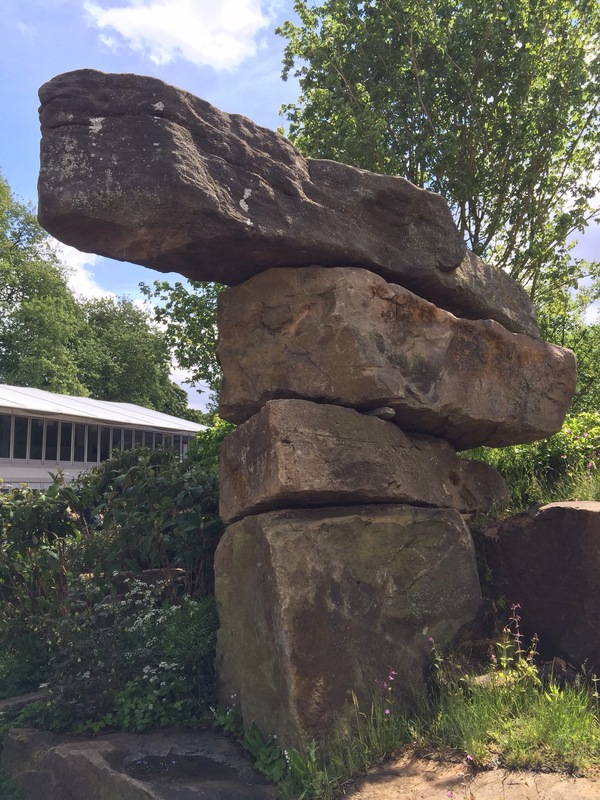 Its majesty was as immense as the Derbyshire rocks that had been brought down from Chatsworth to adorn it. A very proud Duke of Devonshire stood for a while handing out planting schemes and joyfully answering questions from onlookers. I learnt from my chat that the huge burnt out tree stump had not come from Chatsworth but that the dead leaves on the ground had. Much of this garden will be returning to Chatsworth when Chelsea is over. It was a triumph. 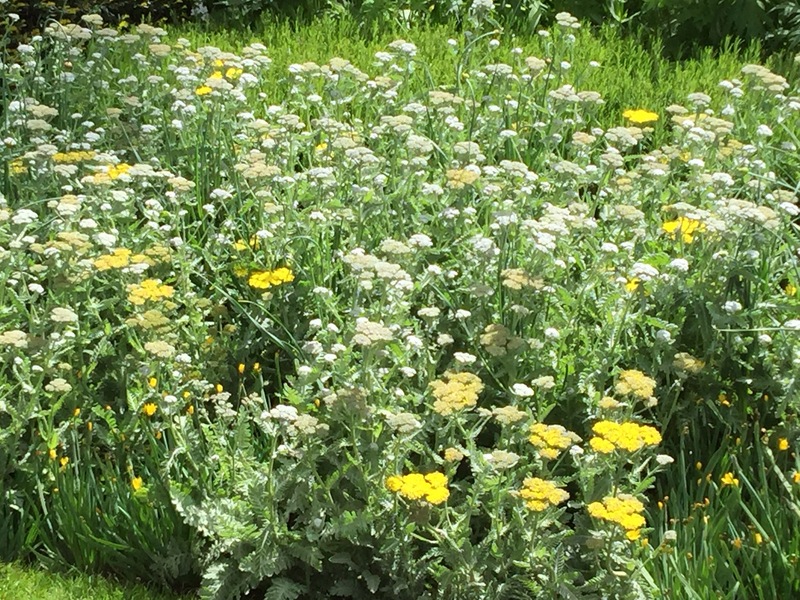 Now sadly I have to disagree with the lovely Monty Don, and this does pain me, as he thought the l’Occitane garden should have taken best in show and I thought it was rubbish. That’s a technical term for you non-gardeners. I thought the garden scruffy and the pavilion aspect was dank and cold looking. But there again what do I know? The trade stands are sometimes difficult to distinguish from the gardens and we all come away dreaming of summerhouses painted in heritage green that rotate to follow the sun. Maybe next year. 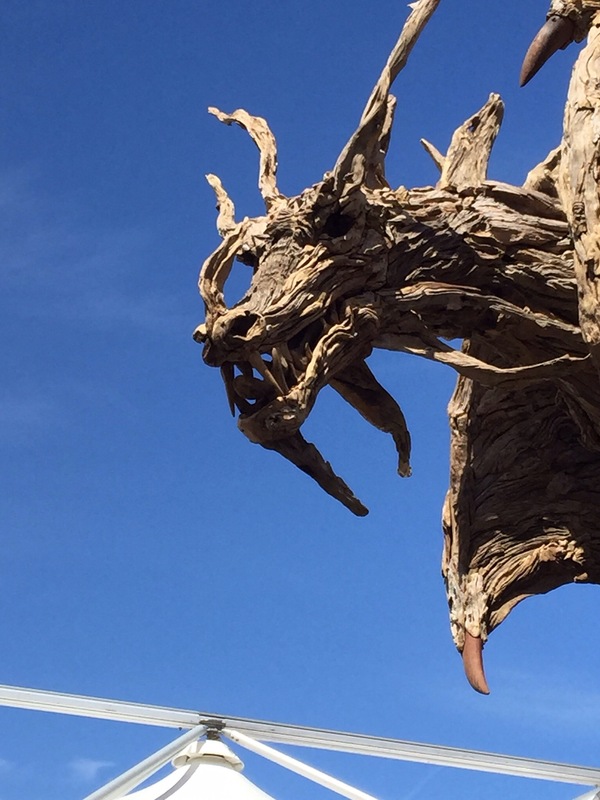 But who wouldn’t want a twenty foot dragon made out of drift wood to put on your shed roof? I was delighted to see that the artist LInda Alexander had taken a stand at Chelsea again this year. 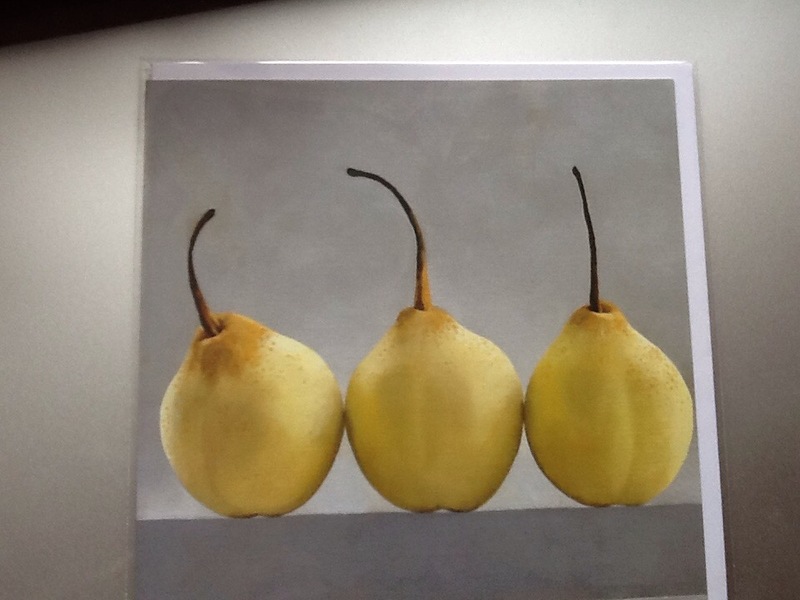 I bought one of her lovely paintings of pears many years ago and I still love it. She tells me that the cards she produces from that painting are still firm sellers for her. I bought a couple myself.